Pyramid Analytics, the leader in Governed Data Discovery for Business Intelligence Analytics today announced expanded business user modeling capabilities including the addition of new cloud, big data and enterprise data source connectors. The Pyramid Analytics BI Office 5.3 release also provides enhanced mobile functionality including improved cross mobile platform support, webpage rendition and reduced bandwidth usage. Access to multiple relevant sources of data is crucial to any organization as the data required for business user analysis and modeling resides in a multitude of disparate locations. In addition to an already rich set of cloud and big data sources such as Azure Hive and Hadoop, BI Office data mash-up capability now also offers data connectors for Amazon Redshift and EMC Greenplum among others. These additional data sources are accessed and brought together in the same governed framework that current customers enjoy; providing extensive modeling capabilities and valuable customer insights across the organization. Data visualization in an easy to understand smart chart or dashboard improves business user comprehension, collaboration and decision making. The enhanced visualization stack in BI Office ensures that data is represented in a consistent and impactful way across any device as users today are increasingly on the go and use multiple screens throughout the day. BI Office 5.3 provides greater consistency by improving mobile and HTML5 renderings while still taking advantage of shared business logic within an organization. BI Office 5.3 brings additional enterprise class functionality to the award winning Business Intelligence platform including management, reporting, security and deployment enhancements. It is now easier than ever to manage and control business intelligence installations while providing greater support and consistency across an organization. 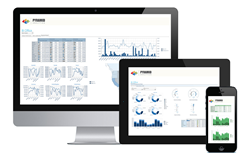 For more information on Office BI 5.3 visit our BI Office Business Intelligence Overview Page. Availability: Pyramid Analytics Office BI 5.3 is available for purchase and update today. Pyramid Analytics BI Office Analytics Platform combines quick and scalable deployment and ease of use that customers have come to expect from the best of the new generation of data exploration tools and delivers it within an enterprise class data governance framework. The platform, available in both in-company cloud and public cloud versions, enables rapid integration of new data sources, cross enterprise sharing of business logic and users of all levels, from analysts to front line managers, to interact through a simple, intuitive and familiar interface to make better, smarter decisions. To learn more, visit PyramidAnalytics.com.